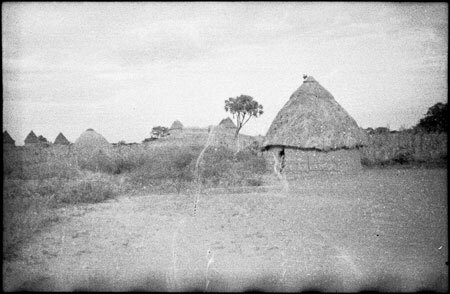 In the foreground is a hut and in the background a homestead on a raised earthen mound, looking similar to the Shilluk Ret's homestead, almost certainly at Kodok, seen in another image. Morton, Chris. "Shilluk village" Southern Sudan Project (in development). 03 Jan. 2006. Pitt Rivers Museum. <http://southernsudan.prm.ox.ac.uk/details/2004.130.36720.1/>.